When you create or customize SharePoint solutions, it is usually best to develop the solution on a local computer where Microsoft SharePoint Server 2010 or Microsoft SharePoint Foundation 2010 is installed. This article describes how to install a development environment with Microsoft SharePoint 2010 and Microsoft Visual Studio 2010. The development environment that you create by using these instructions will not support SharePoint farm installations, and you should not host active production sites with this configuration. These instructions enable you to get started with an environment that is specifically suited to developing SharePoint custom solutions. For a Windows PowerShell script that installs and configures all of the prerequisites and products that you will need to get started with SharePoint Server 2010 development, see SharePoint 2010 Easy Setup Script. The requirements for a development environment are less stringent and costly than the requirements for a production environment, and the guidelines in this topic do not support a production environment installation. You have several options for preconfiguring the operating system of a local computer on which you will install SharePoint 2010 for development purposes. The choice that you make will be determined by factors specific to your organization and environment (such as budget, the size of your development team, and the operating systems that you and your organization are already using). In any development environment, you should use a computer with an x64-capable CPU, and at least 2 gigabytes (GB) of RAM to install and run SharePoint Foundation; 4 GB of RAM is preferable. You should use a computer with 4 GB of RAM to install and run SharePoint Server; 6 GB to 8 GB of RAM is preferable. Install SharePoint on Windows Server 2008 Service Pack 2 x64 (or Windows Server 2008 R2 x64). Use Microsoft Hyper-V and install SharePoint on a virtual machine running a Windows Server 2008 Service Pack 2 x64 (or Windows Server 2008 R2 x64) guest operating system. Install SharePoint on Windows 7 x64, Windows Vista Service Pack 1 x64, or Windows Vista Service Pack 2 x64. Use Microsoft Hyper-V and install SharePoint on a virtual machine running a Windows 7 x64, Windows Vista Service Pack 1 x64, or Windows Vista Service Pack 2 x64 guest operating system. You must install the WCF Hotfix for Microsoft Windows. The hotfix is available for Windows Server 2008 Service Pack 2, Windows Vista Service Pack 1, and Windows Vista Service Pack 2 and for Windows Server 2008 R2 and Windows 7. This change significantly improves the initial page load time after you have installed a solution to the bin directory. You must install the ADO.NET Data Services Update for .NET Framework 3.5 SP1 to enable REST-based data services. This update is available for Windows Server 2008 Service Pack 2, Windows Vista Service Pack 1, and Windows Vista Service Pack 2 and for Windows Server 2008 R2 and Windows 7. Windows 7 and Windows Vista cannot be used for production deployments of SharePoint 2010. If you use Windows 7 or Windows Vista for your development environment, you should have access to a test environment that has the same operating system installed as your production environment. Windows 7 and Windows Vista are recommended only for developer workstations and should be used only for stand-alone installations. You can use a separate Microsoft SQL Server instance, but you should not configure your installation as a SharePoint farm and you should not host active sites on this configuration. SharePoint requires your operating system to have certain prerequisites installed before installation begins. 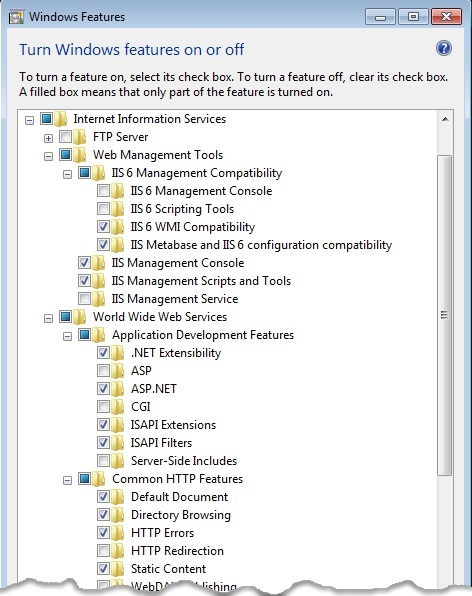 For this reason, SharePoint includes a PrerequisiteInstalle.exe tool that installs all of these prerequisites for you. If your developer workstation is set up with the Windows Server 2008 Service Pack 2 or Windows Server 2008 R2 operating system, you can install SharePoint 2010 by running the PrerequisiteInstaller.exe tool (which is included with SharePoint 2010) to install the prerequisites that SharePoint needs, and then run Setup.exe. However, you cannot use PrerequisiteInstaller.exe on Windows 7 or Windows Vista. For those operating systems, you must follow the additional instructions in this section. Because the default installation works only for Windows Server 2008, you must edit one configuration file and install many of the prerequisites manually. You must perform each of the following steps while logged on with an account that has administrator access on the local computer. These steps assume that you received the SharePoint 2010 distribution as a single compressed executable file named SharePointFoundation.exe for SharePoint Foundation 2010 and setup.exe for SharePoint Server 2010. Extract the installation files by opening a Command Prompt window, and then typing the following command at the directory location of the folder where you copied the installation files in the previous step. Review the complete configuration file. 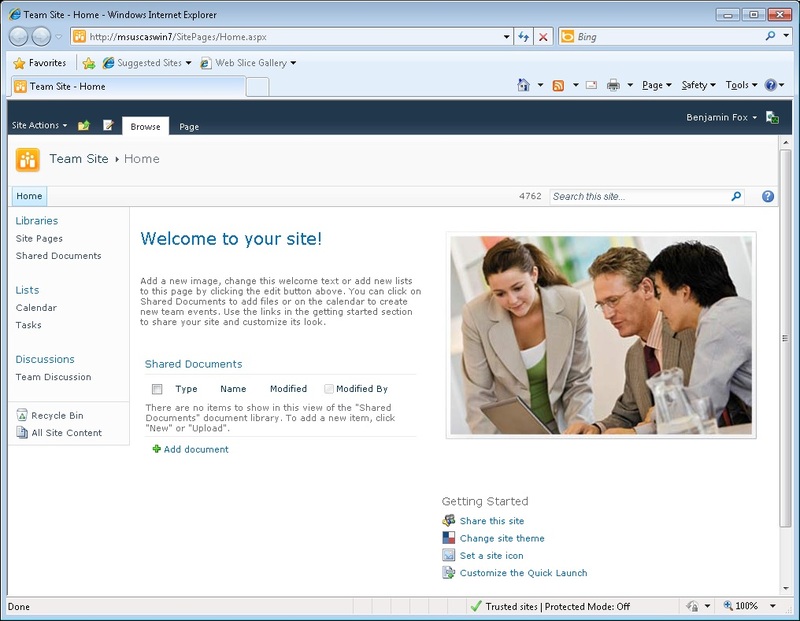 It now looks similar to the following for SharePoint Foundation 2010. The complete configuration file will be longer for SharePoint Server 2010 (and therefore the text below cannot replace the contents of that file), but should use the same setting for the AllowWindowsClientInstall attribute. All of the text in this configuration file is case-sensitive. If you do not edit the configuration file as described in the previous step or if you do not save the configuration file, when you try to run the installation you see the error message shown in Figure 1. Chart Controls (this is not required if you are going to install SharePoint Foundation 2010). SQL Server Analysis Services - ADOMD.Net (this is not required if you are going to install SharePoint Foundation 2010). Manually enable each of the required Windows Features. You can do this quickly by copying and running the following command in a Command Prompt window. The following text contains line breaks. Verify that the required Windows Features are enabled. The command in the previous step enables all of the required features in the Internet Information Services section of the Windows Features dialog box (which you can access through the Programs section in Control Panel). Use Figure 2 and Figure 3 to check that you have enabled all of the required Windows Features. If any features are missing in your operating system, return to the Internet Information Services section of the Windows Features dialog box and enable them. The following figures represent one Windows Features dialog box on a computer running the Windows 7 operating system. They have been broken into two figures for the sake of readability. The list of Windows Features will look the same on Windows Vista. Restart your computer to complete the changes that you made to Windows Features. On the Choose the installation you want page, click Standalone to install everything on one developer workstation. If any errors occur in the installation, review the log file. To find the log file, open a Command Prompt window, and then type the following commands at the command prompt. The log file is displayed at the end of the directory listing. A link to the log file also appears when the installation is complete. Install SQL Server 2008 KB 970315 x64. After the Microsoft SQL Server 2008 KB 970315 x64 installation is finished, complete the wizard. The SharePoint Products and Technologies Configuration Wizard may fail if you are using a computer that is joined to a domain but that is not connected to a domain controller. If you see this failure, connect to a domain controller either directly or through a Virtual Private Network (VPN) connection, or sign in with a local account that has administrative privileges on the computer. After the configuration wizard is complete, you see the new SharePoint site. Download and install the Microsoft SharePoint 2010 SDK. After you set up a working development environment on a physical host computer, you can store your setup as a virtual computer, so that others can use it, or so that you can reuse this "clean" installation at a later date. Alternatively, you can set up a development environment on a newly created virtual machine. The Hyper-V role in Windows Server 2008 Service Pack 2 provides infrastructure and management tools that enable you to create multiple server environments on a single host. For more information, see Getting to Know Hyper-V: A Walkthrough From Initial Setup to Common Scenarios. For a useful Windows PowerShell script that enables you to create a virtual hard drive (VHD) out of an existing Windows Server 2008 image, see Install-WindowsImage PowerShell Script on MSDN Code Gallery. If you are using Windows 7, you can also create a VHD on which SharePoint is installed in Windows Hyper-V, and then configure Windows 7 with BDCEdit.exe so that it boots directly to the operating system on the VHD. This improves performance because the virtualization layer is not present. It also enables you to use VHD differencing disks (VHDs that contain only elements that differ from a single base installation), which save disk space and make it easier to roll back changes. See Deploy Windows on a Virtual Hard Disk with Native Boot to learn more about this kind of configuration.